We are all too familiar with the setting portrayed on television news of the police chasing a driver who will not stop. The helicopter circles above, while the TV newscasters babble with foolish questions and comments, as we sit frustrated and impatient for the end to come. Sam was born in Mexico. His mother immigrated to the Bakersfield area to work the fields. Sam never knew his father. At age 16, he hooked up with a bad crowd that got him thrown out of the house. Without money, Sam quickly found his friends were short-lived. By the grace of God, an angel came into his life at that time. Her name was Hope, an older friend of his mother. She saw some good in Sam and let him stay with her. Sam soon realized his mistakes, got it together and finished high school. Like too many young men, he fathered a child, Samantha, who now is married and a mother herself. Sam worked for years in a Bakersfield winery, learning almost every job in the process, from picking grapes to winemaking. 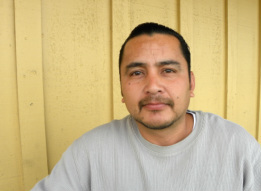 He moved to Oxnard with his wife and the two younger daughters, Denica and Brandy about ten years ago. Financially and personally there was a constant struggle, putting many pressures on his marriage. Employment came and went with low pay and limited security. Sam enjoyed becoming involved with the Child Development Center his daughters attended and joined the Board as a caring parent. He even attained a Medical Assistant Certificate. But recently he found himself alone after he lost his job and his wife left him. Sam visited Catholic Charities’ Oxnard office and discussed his situation with Janet DePrima. Janet was aware that the court would allow Sam to work off his fines by performing volunteer work at Catholic Charities, cleaning up, maintenance, handing out food. After working the past four months at Catholic Charities, Sam has fit in very well and has been an inspiration to all he comes in contact with. Sam has a court date to get his driver’s license reinstated. He is full of hope and expects that by next year he will be gainfully employed, erasing his past debt and continuing to be involved in his daughters’ education. He hopes his story will move others to recognize their own value and make positive changes in their lives.